Millennial women are changing what it means to be powerful and successful in the world—for everyone. Forever. 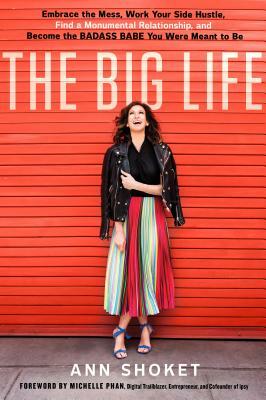 You want The Big Life—that delicious cocktail of passion, career, work, ambition, respect, money, and a monumental relationship. And you want it on your own terms. Forget climbing some corporate ladder, you want a career with twists and turns and adventure. For you, success only matters if it’s meaningful. Ann Shoket knows the evolving values of young women more than anyone. She’s the voice behind the popular Badass Babes community, a sisterhood of young, hungry, ambitious women who are helping each other through the most complex issues around becoming who you’re meant to be. As the trailblazing editor-in-chief of Seventeen for the better part of a decade, Shoket led provocative conversations that helped young women navigate the tricky terrain of adolescence and become smart, confident, self-assured young women. Now that they are adding muscle to the framework of their lives, she’s continuing the conversation with The Big Life. • How to craft a career that’s also a passion. • How a side hustle will make you smarter, hotter, and more in control of your destiny. • Why work/life balance is a sham and your need to embrace the mess. • How to find a partner whose eyes light up when you talk about your ambition. "Giving back is a crucial part of the Big Life for me and my generation. Ann shows us that we succeed when we help others succeed." "Ann Shoket is a fresh and credible voice for a new generation of women leaders who are redefining success. With authority and wit, Ann guides young women who are already making their mark in unlocking The Big Life we promised them, and that they deserve."